Report from Tuesday’s LPC Meeting: Commissioners Say Lower the Height! 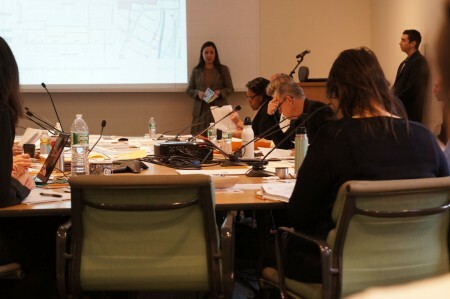 There’s good news and bad news from last Tuesday’s Landmarks Preservation Commission meeting on the proposed massive Gansevoort development project. A big thank you to everyone who wrote emails or attended the meeting! The LPC says that In the week leading up to the hearing they received an incredible 820 emails opposing the project, and over 30 community residents were in the audience to listen to the commissioners’ discussion (the public was not allowed to speak at this meeting). 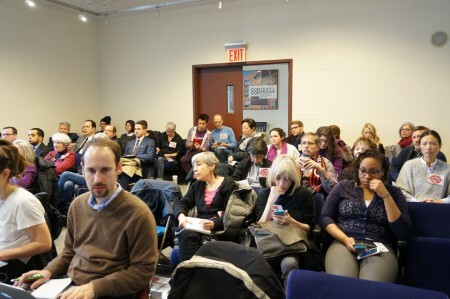 At the first LPC hearing (last November), 150 people packed the meeting room in opposition. 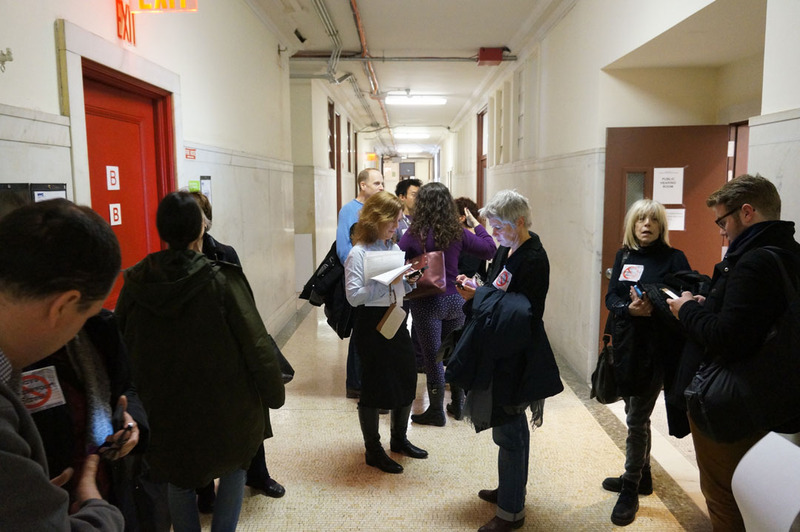 So many people testified against the project that time ran out and the hearing was adjourned before the commissioners had any opportunity to ask questions or make comments. We were left with no idea about what they thought of the proposal. 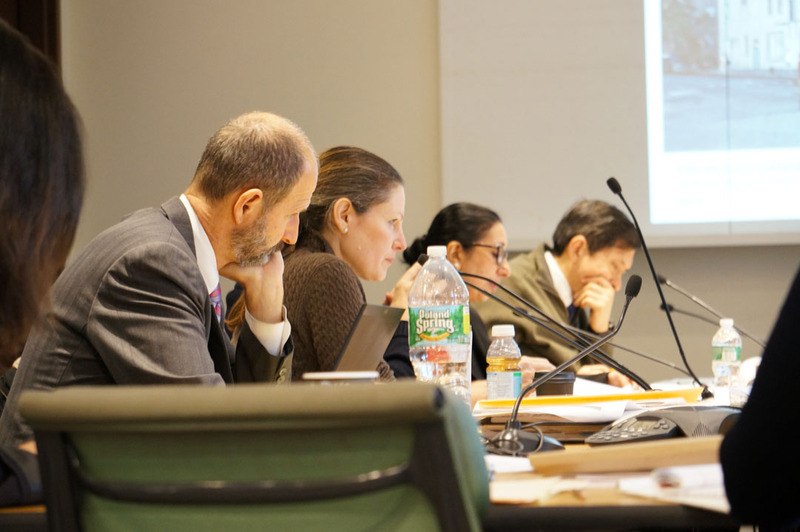 At Tuesday’s meeting, the commissioners finally had a chance to speak. Now the good news. The commissioners heard our concerns about the height and scale of the proposed project. First, they took the developers’ argument to its logical conclusion, and said that if the developers replaced the low-scale market buildings at 60-68 Gansevoort with a new structure intended to replicate the previous tenement buildings, then the new structure should not be taller than the tenement buildings it is supposedly intended to replace. This means a significant reduction in the height of the proposed new building. The setback 6th story will have to be removed (which will lower the building by 15′), and the remaining structure will then have to be further reduced in height. The commissioners also told the developers to remove the two setback stories from 74 Gansevoort Street (lowering the building by 29′). In addition, the commissioners expressed concern about the size of the new structure even with the two setback stories removed, and told the developer to “scale back” the building. 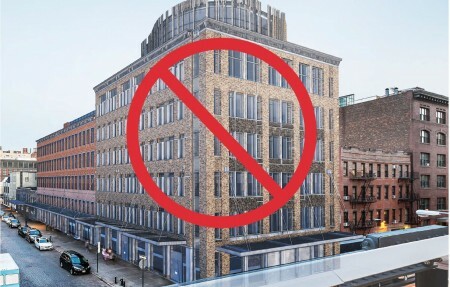 Both the developer and the commissioners describe the new building planned for 74 Gansevoort Street as a “loft-style” building; such buildings are typically much lower than the structure currently proposed. We’ll present more details about this shortly, and we need to make sure that the commissioners follow through and not approve any revised plan that fails to meet the requirements they described at Tuesday’s meeting. Additionally, the commissioners said that the height of the new building planned for 50 Gansevoort Street should be substantially reduced, and several commissioners said they would like to see this building not exceed two stories. The LPC asked the developers to revise their project to take the above considerations into account. When the developer completes these revisions (probably in 1-3 months), the LPC will hold another public meeting to consider the revised plan. At that future meeting, LPC will have the option of either voting to approve the new plan or sending it back to the developers for further revisions. Video of the hearing can be viewed here. Stay tuned for more info! 1 CENTRE STREET, 9th Floor (at Chambers Street). Entrance is at the south end of the building. We anticipate that the Commissioners will question the developer, ask him to respond to the public comments, and then ask the developer to make revisions to the proposal. Whether those requested revisions will be significant is the big question! Whether or not you can attend the meeting, please send an email to LPC right now telling them why you oppose this project! The Landmarks Preservation Commission will be holding its next meeting on the massive Gansevoort Development project Tuesday, February 9th. It’s important that they receive as many emails as possible reminding them how strongly our community opposes this project (copies will also be sent to our local elected officials). Please send a message now (and please send this message even if you have already signed our petition)! Preserve Gansevoort Street's Historic Market Character! I strongly oppose the proposal to transform the scale of Gansevoort Street and profoundly alter its market character. The planned 120' and 98' tall structures would be grossly out-of-scale and out-of-character with this block and the surrounding market buildings. In 2003, the Landmarks Preservation Commission chose to landmark Gansevoort Street in its current low-scale market configuration, the form in which it has existed for the past 75 years. The Commission did so for good reason. The LPC's designation report is clear: the Gansevoort Market Historic District – and the Gansevoort block in particular – was designated to preserve the area's unique market character and history. The Gansevoort block is the only remaining intact block consisting entirely of one- and two-story market buildings in the Historic District. The 1930's alteration of the Gansevoort buildings from residential to low-scale market structures, as the designation report explicitly states, represents an essential phase in the district's history: a time when the market expanded due to innovative new transportation projects and great economic change. The market buildings of the Gansevoort block in their current form exemplify precisely the history and character that the Landmark designation is intended to protect. They should be preserved for posterity, not demolished or transformed beyond recognition. Additionally, let's get the facts straight. The developers' proposed structures would be nearly twice as tall as the 5-story tenements they claim they wish to replicate. The pre-1930's buildings were almost certainly no higher than 60'. The new structures would be 98' and 120' tall (including mechanicals). This is in part because the new structures would be 6 and 8-stories tall, not 5-stories, and in part because of the new structures' extremely large 14-15' floor-to-ceiling heights. I urge you to reject this misguided plan. I strongly oppose the proposal to transform the scale of Gansevoort Street and profoundly alter its market character. The planned 120′ and 98′ tall structures would be grossly out-of-scale and out-of-character with this block and the surrounding market buildings. The LPC’s designation report is clear: the Gansevoort Market Historic District – and the Gansevoort block in particular – was designated to preserve the area’s unique market character and history. The Gansevoort block is the only remaining intact block consisting entirely of one- and two-story market buildings in the Historic District. The 1930’s alteration of the Gansevoort buildings from residential to low-scale market structures, as the designation report explicitly states, represents an essential phase in the district’s history: a time when the market expanded due to innovative new transportation projects and great economic change. The market buildings of the Gansevoort block in their current form exemplify precisely the history and character that the Landmark designation is intended to protect. They should be preserved for posterity, not demolished or transformed beyond recognition. Additionally, let’s get the facts straight. The developers’ proposed structures would be nearly twice as tall as the 5-story tenements they claim they wish to replicate. 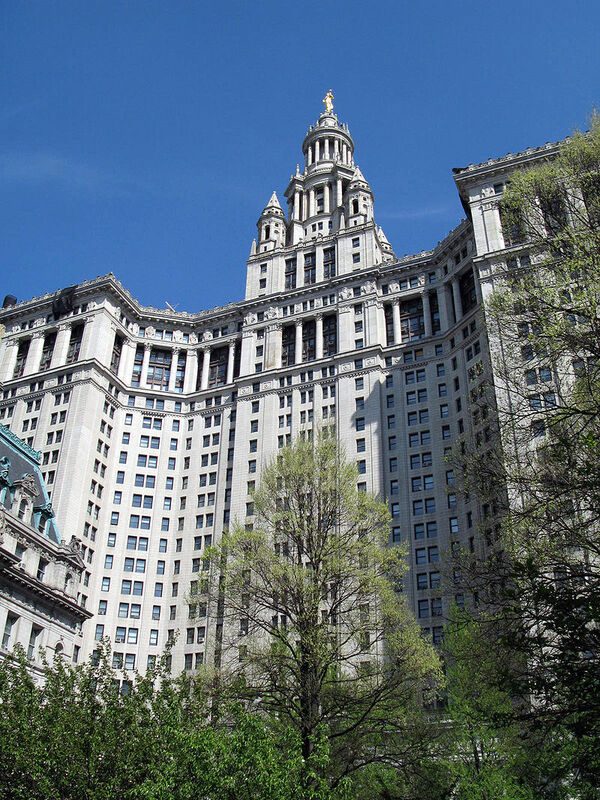 The pre-1930’s buildings were almost certainly no higher than 60′. The new structures would be 98′ and 120′ tall (including mechanicals). This is in part because the new structures would be 6 and 8-stories tall, not 5-stories, and partly because of the new structures’ extremely large 14-15′ floor-to-ceiling heights.